In the upper test, the selector is ID. 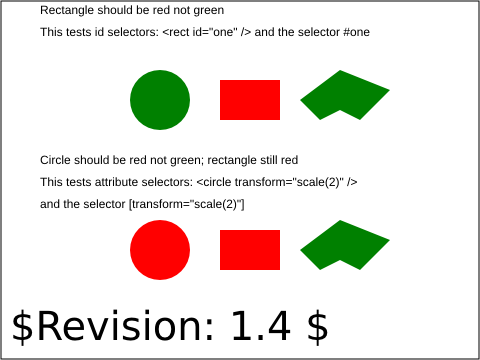 The two 'rect' elements have id="one" and id="two" respectively and the selector #one, #two selects the rectangles and gives them a red fill. 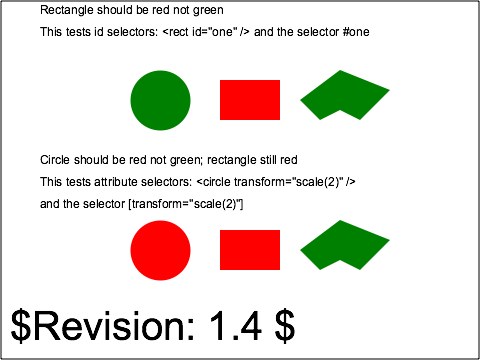 The rectangle should be red, with the circle and polygon green. In the lower test, the selector is on an arbitrary attribute. The transform attribute has a value of "scale(2)" on the circle in the lower test, and if correctly selected this circle will be filled red (if the transform itself fails, the circle will be in the wrong position at the wrong size). The rectangle should also be red. The polygon has a points attribute and is a child of an element with id="x" so the selecto #x [points] matches, making the polygon green.